[SG] Revisiting Saveur - As good as the last meal! Have you ever had one of those nights where you just wanted to have a simple and good dinner without burning a hole in your wallet? Nothing fanciful nor a meal to impress the lady but just a calories-worthy satisfactory meal. 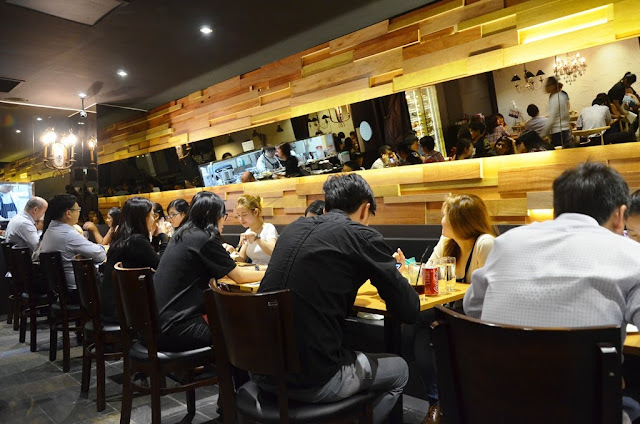 Then again, it does not seem quite that easy to churn out a list of such restaurants at the back of my head without having to do some Googling work. Strolling along Scotts Road, it suddenly occurred to me that we had not try the secondary outlet of Saveur that is located at Far East Plaza! 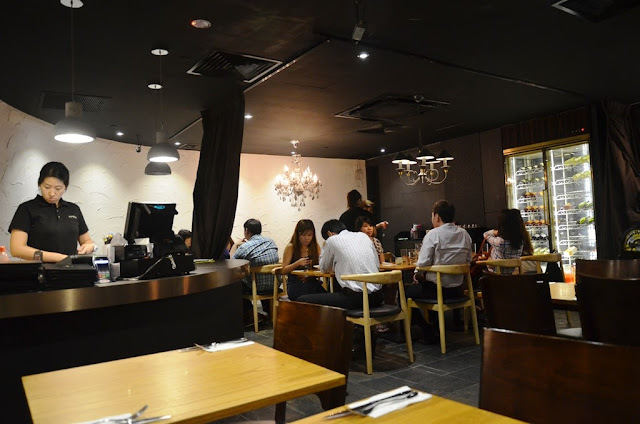 It is one of those names that I associate French dining with affordable pricing and that seemed like a rarity in any developed world's context, not to mention Singapore. 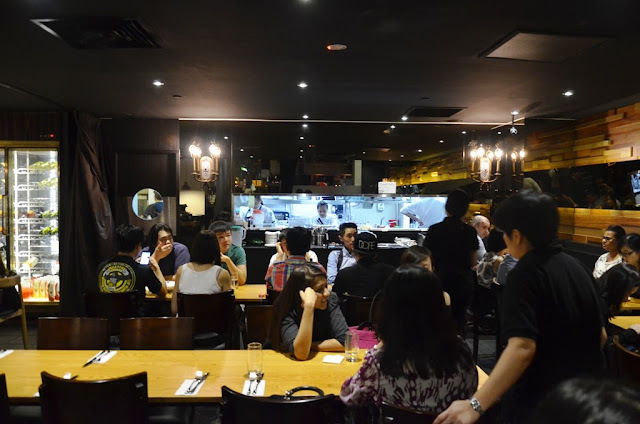 At the back of a memorable dining experience quite a while ago (review may be found here) at their primary outlet located on Purvis Street, will quality be compromised now that they are expanding and at a high traffic area which commands quick turnaround of tables? 'Ring ring, ring ring! ', my phone finally rang after some 15-20 minutes and a table was ready! Right... it was not all that dramatic but moving on, we gingerly walked down some narrow steps to a basement flooring decorated with wooden furnishings and mirror panels. I requested for the server to store our cake in the fridge and they were more than willing to do so. 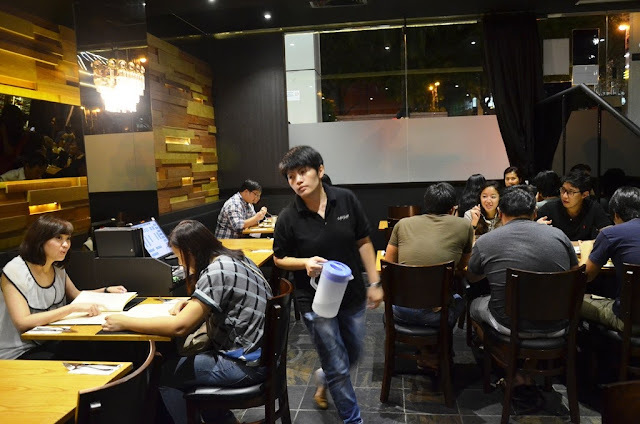 There was also a partially open-kitchen concept at the end of the restaurant where you could catch a glimpse of the culinary action going on. Quite frankly, the seating arrangement was not perfect. Expect to sit really close to your neighbours and if you are nosey enough, perhaps eavesdrop on them gossiping about their colleagues. While it might not fit the setting for the 'Exclusive French Dining' experience, you are equally not paying the kind of prices at an atas French restaurant. With the setting introduced, let us share with you our table of food! Flipping through the pages of the menu, this appetizer certainly caught my attention with it categorized under the 'Specials' offering. 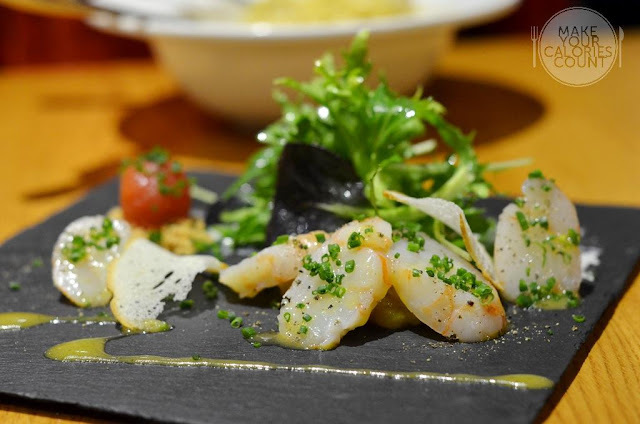 Tossed in herb soil, drizzled with mango salsa, citrus cream and mango vinaigrette, the King Tiger prawns were uniformly sliced at a titled angle taking particular care to cover each bite-size portion with the finely diced herbs. The presentation was beautiful and certainly draw diners' attention, with our neighbours across throwing some salivating glances before asking for the name of the dish. What I particularly enjoyed about this simple appetizer was the complementation in textures with the soft cherry tomato, crunchy prawns and paper-thin bread toasts that cut through sharply with a crisp. On the flavours, we were highly drawn as we personally have a preference for zesty flavours yet not overdoing with the levels of acidity. While the overall taste was a inclined towards a pleasantly sourish aftertaste, the balance was struck well with just the right amounts of sweetness in the citrus cream and mango vinaigrette. To top it off, you could add a glass of Rose wine (Rutherford Round Hill White Zinfandel) at an additional S$10 with every order of this appetizer. 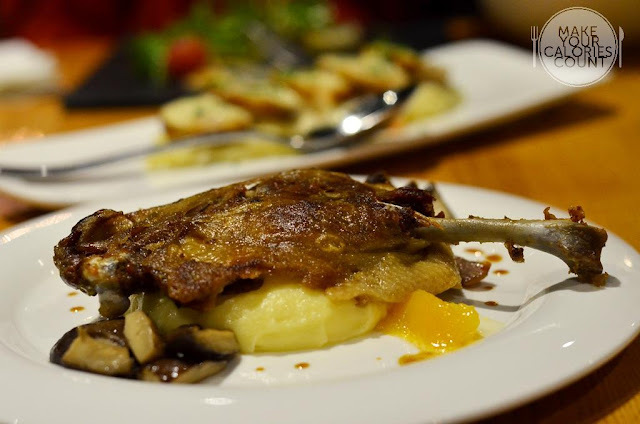 This is one of Saveur's signature dishes and served as a starter. 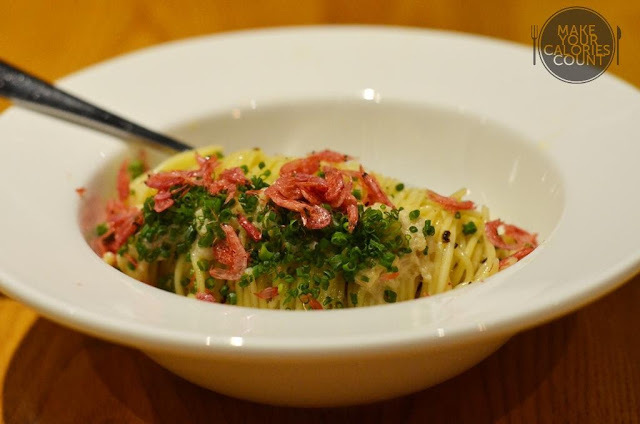 It was simple pasta tossed with chilli oil, fine-chopped Japanese konbu and sakura ebi with minced pork sauce. One of the most enjoyable elements was non-other than the layer of texture created with the crispy sakura ebi (cherry shrimp). 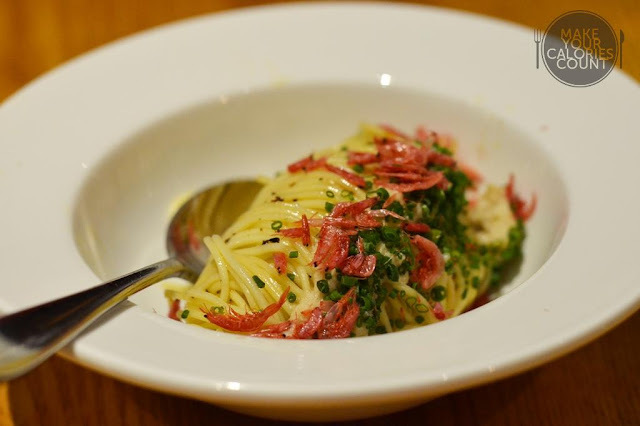 The pasta was cooked al dente and sprinkled with finely diced spring onions for that extra punch of fragrance. The portion of the minced pork sauce could surely be improved upon to give a stronger contribution to the overall flavours to enhance the offering to one's palate. 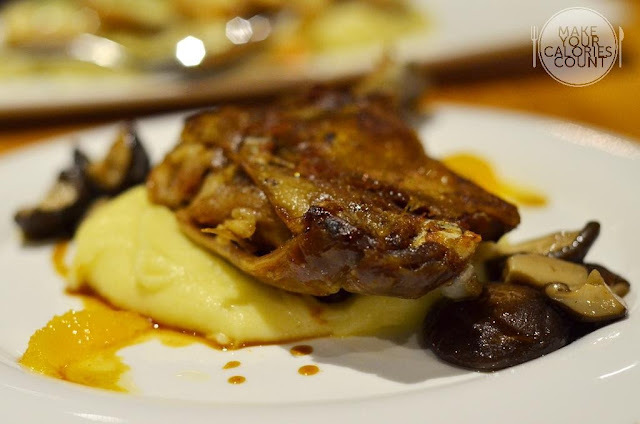 Served alongside homemade mashed potato, sauteed Shitake mushroom, orange segments and orange infused natural jus, this main was one of the signatures and must-try. Quite simply, just look around the restaurant and you would find that most of the diners at the tables would have this as a staple at Saveur. We enjoyed the crispy skin coating the tender red meat on the inside. It was cooked just nice which allowed the flesh on the inside to retain moisture. While the portion size was not the most generous, you definitely would get your buck's worth. The homemade mashed potato was creamy, refined in texture and really smooth. While the mash and the protein was a more savoury touch, it was beautifully spiced with the tang from the elements of orange introduced which added a hint of sweetness to complement. The Shitake mushrooms were also cooked perfectly, retaining the firmness within. Overall, the dish would be proud enough to be the restaurant's signature. 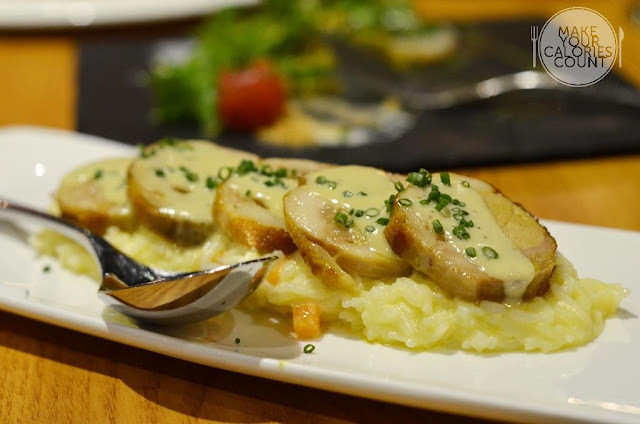 The roulade comprised of wrapped chicken thigh filled with foie-gras infused chicken stuffing which was then sliced uniformly and spread across creamy basmati rice and parmesan sauce. This would appeal strongly to those with a preference for creamy and cheesy food. The creamy basmati rice had a taste resembling that of risotto in terms of texture and was cooked with a slight hardness remaining in the rice. Personally, I found it could be a bit satiating on the appetite due to the cheese and cream but my lady enjoyed it a lot more than me. The stuffing and protein was well-cooked in general, remaining moist and tender. Expect to be overwhelmed with lots of flavours with this dessert. From presentation to taste, there was a lot going on in each spoonful that goes into my mouth. 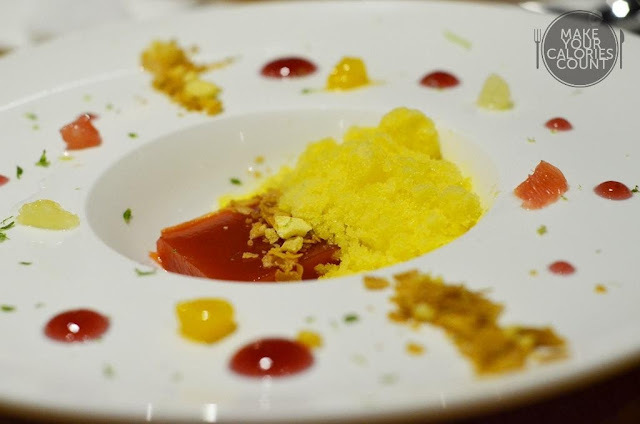 With a blood orange jelly with orange granite, freeze-dried pineapple, feuilletine, citrus segments and lime zest, this is a must-order for those with a citrus-zesty palate. 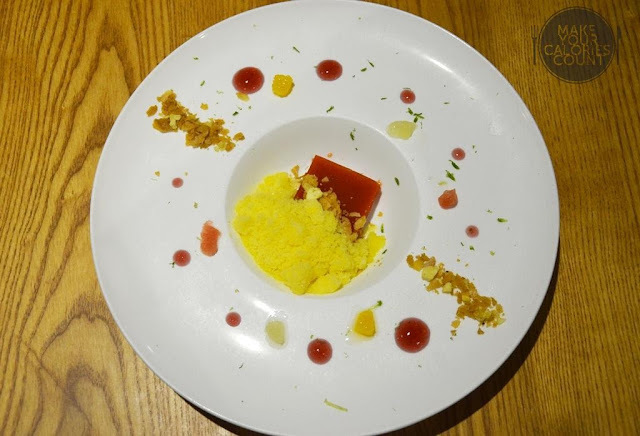 The blood orange jelly complemented the melt-in-your-mouth freeze-dried pineapple and feuilletine gave that crisp flake like texture to make the different ingredients harmoniously synchronized. On the whole, while the flavours were citrus and on the sourish end, the natural sweetness from the orange made it very refreshing and tantalizing indeed. It might however be too intense for those with a milder palate. As you can see from the pictures, space between the tables may not be as comforting and while there are no tall and suave French men nor classy ladies to bring you glasses of red wine, the waiting staffs were polite, friendly and we had no problems trying to capture their attention at any point in time. Plain refillable ice water is available for free and overall, the quality of food was good and above average. The chefs had put a conscious effort in terms of plating and pairing of ingredients to make each dish presentable and calories-worthy. I would however barely recommend this to be the dating spot to bring your other half if you are after a romantic French dinner for it could get quite boisterous though not to an extreme effect.